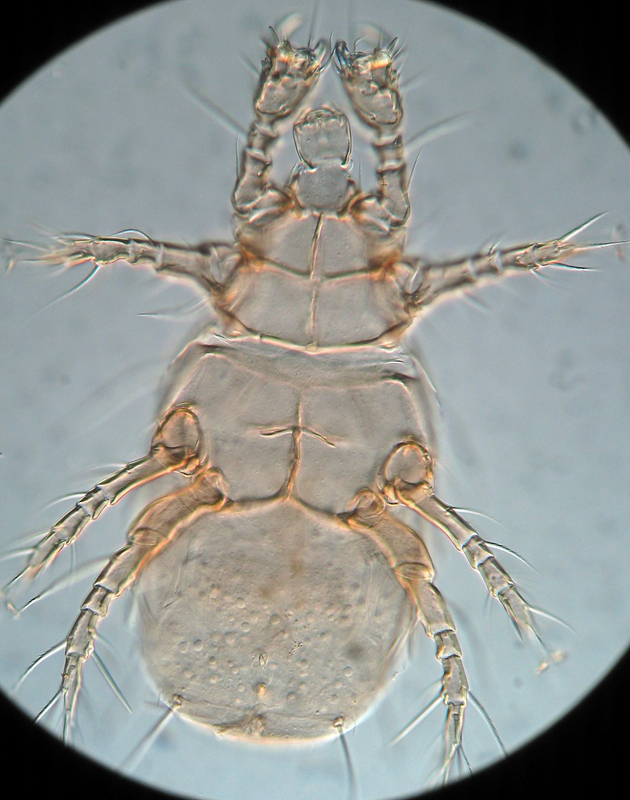 A few posts ago I presented a puzzle – what were the strange arthropod-like creatures I found in a KOH-dissolved slurry of eastern gray squirrel skin? I canvassed colleagues from around the world, and none had a definitive answer (though Terry Galloway from the University of Manitoba guessed the correct order, or suborder depending on your taxonomy). Yesterday I received a second square of skin from the same squirrel, also sent by Jamie Rothenburger. This time I didn’t dissolve it in KOH but rather just plopped it in ethanol and examined it underneath a dissecting scope. Lo! Dozens of the tiny mystery animals were attached to the squirrel’s hairs. Even better, four older instars, including an adult, were also present. So, what did they turn out to be? 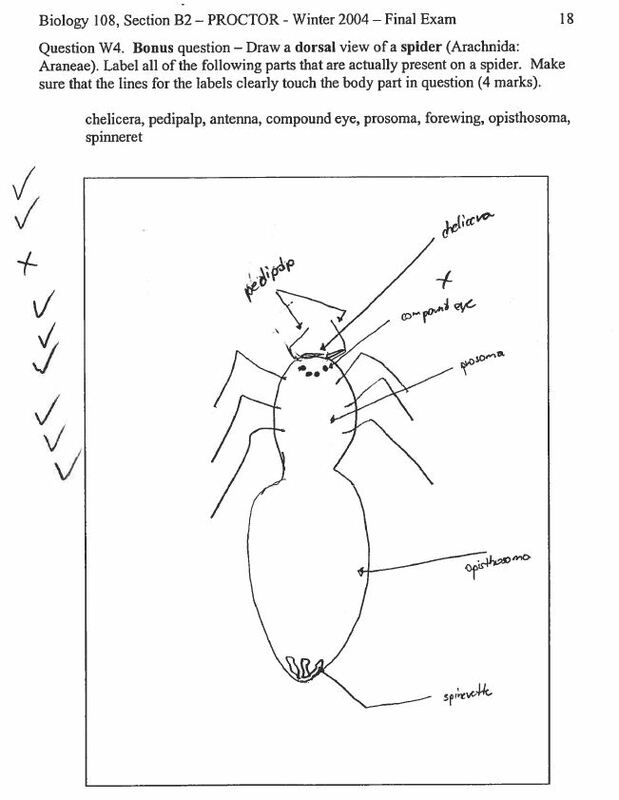 Sucking lice (Anoplura), most likely Enderleinellus longiceps Kellogg & Ferris based on papers by Kim (1996 a, b). UPDATE: no, it is not E. longiceps, it doesn’t even belong to that genus. 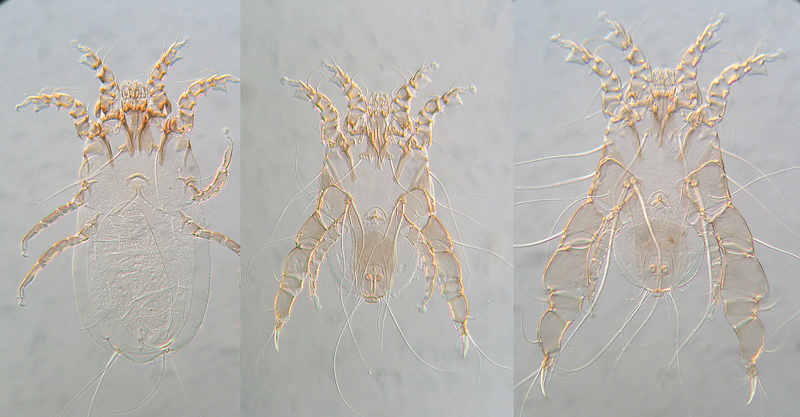 I keyed out the adult female today and she turned out to be Neohaematopinus sciuri Jancke based on Kim et al. (1986). I was a bit too eager to get photos of the critters and didn’t wait until the slides were completely cured, so the images below are a little blurry. 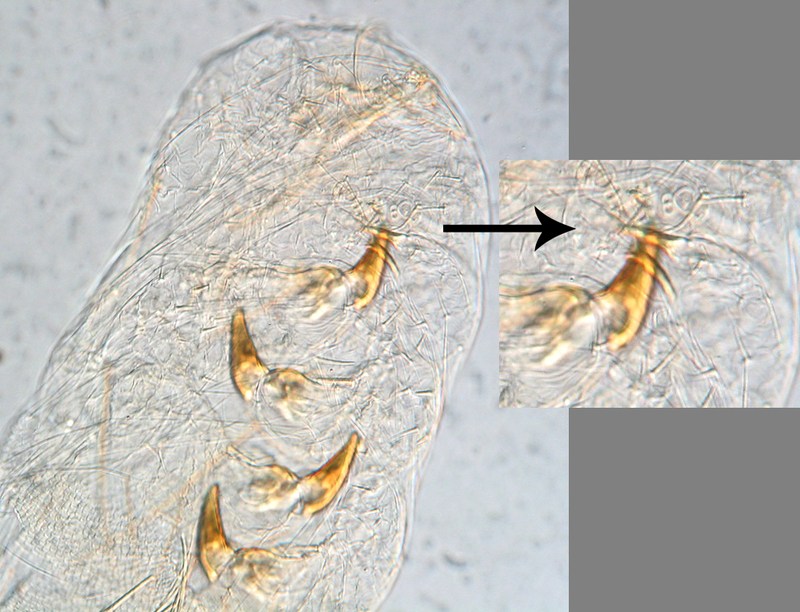 First are photos of embryonic lice still in eggs, then photos of what I think is a second nymphal instar. The scalloped structure beneath the tarsal claw that was particularly obvious on the legs of the animals in the original post are less striking in the nymph. Two eggs on a squirrel hair, one occupied. Close-up of one embryo popping out of the egg. 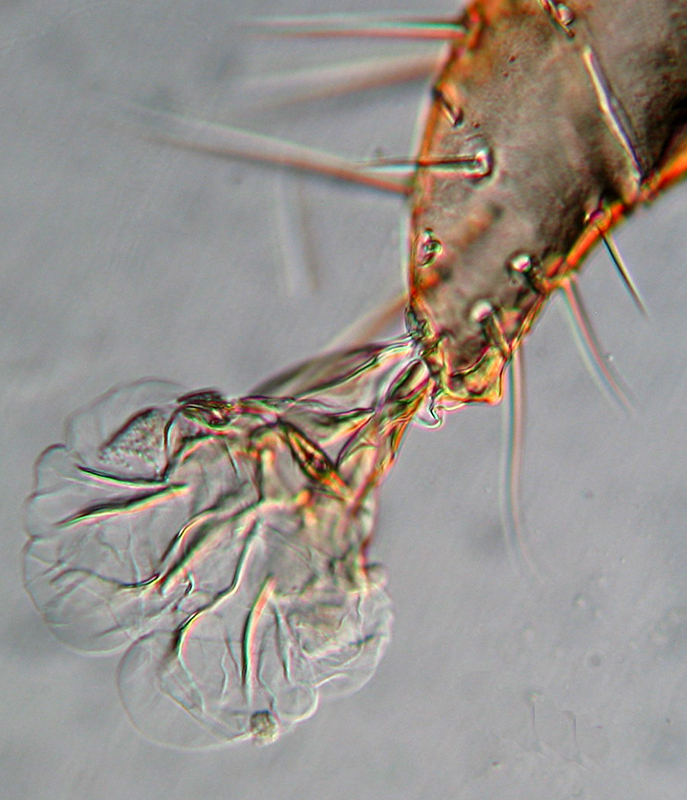 Nymphal sucking louse, Neohaematopinus sciuri. 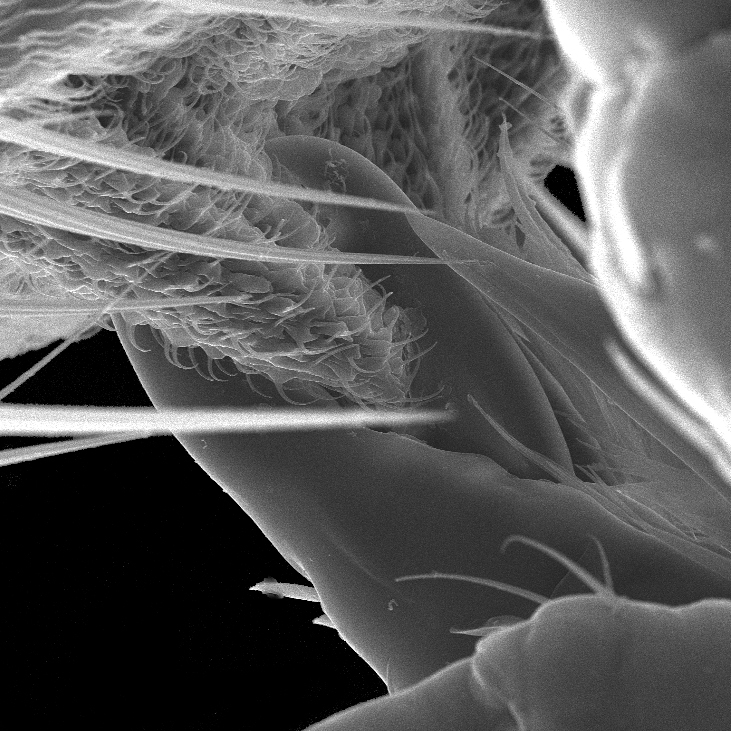 Internal mouthparts of the nymph. Tarsus of second leg showing faint scalloped structure. 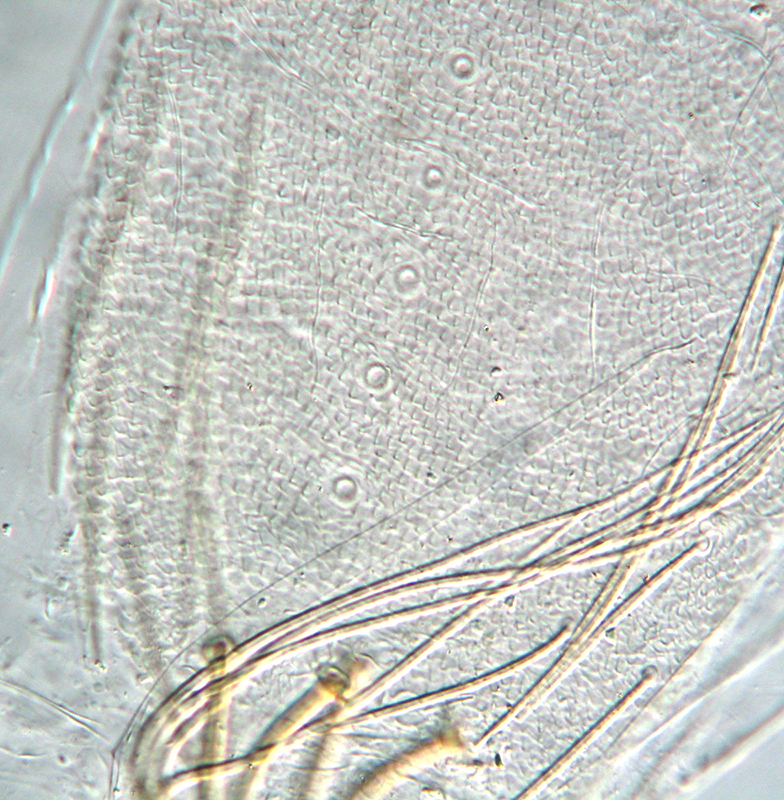 A nice scaly patch of integument from the dorsum of the nymph. 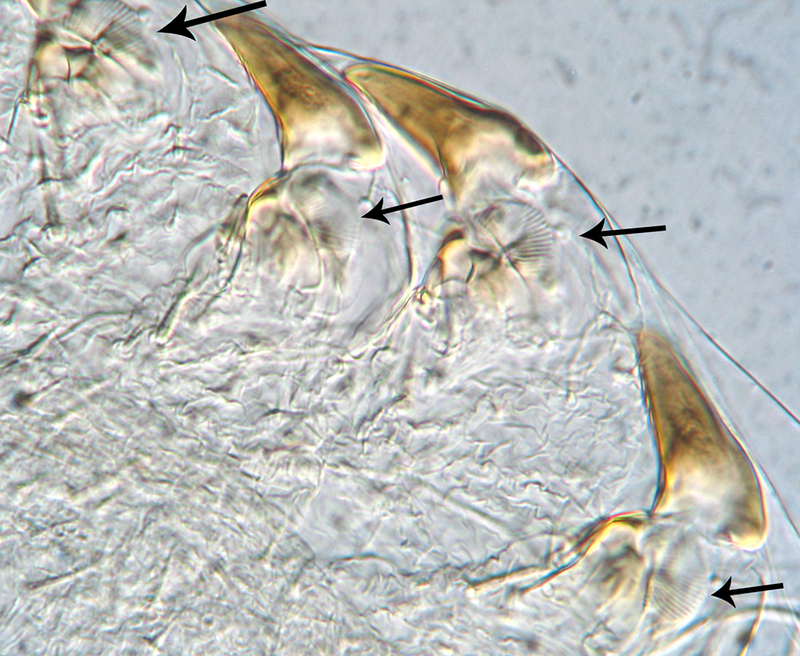 Relative sizes of tarsal claws of legs I to III and shape of the sternal sclerite (arrow) helped to identify the female as belonging to the family Polyplacidae and the genus Neohaematopinus. Kim, K.C. 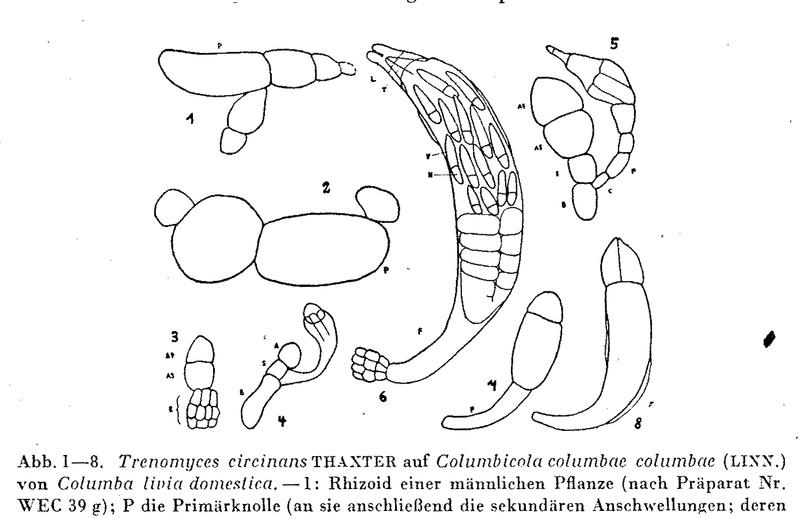 1966 The nymphal stages of three North American species of the genu Enderleinellus Fahrenholz (Anoplura: Hoplopleuridae). J. Med. Ent. 2: 327-330. Kim, K.C., H.D. Pratt and C.J. Stojanovich. 1986. 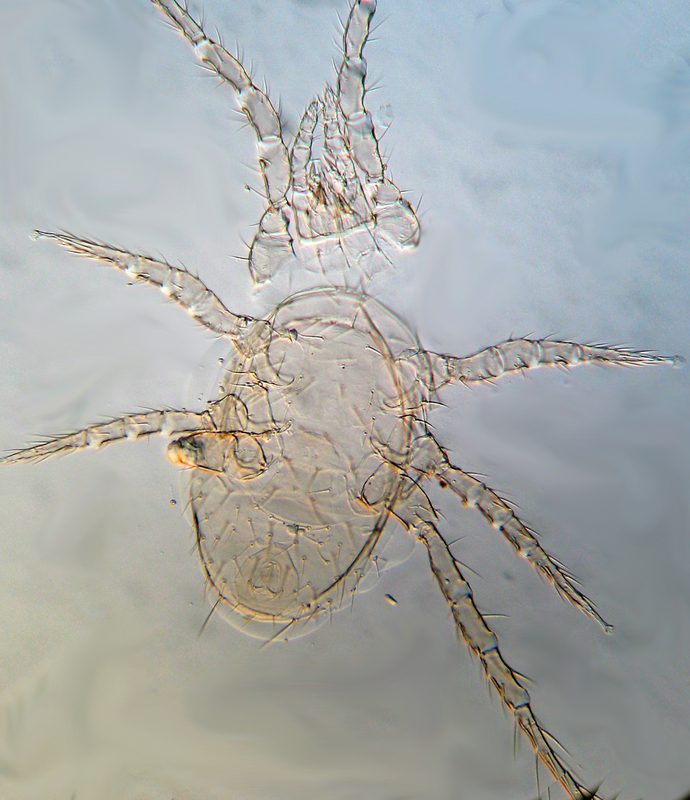 The Sucking Lice of North America: an Illustrated Manual for Identification. Pennsylvania State University Press, University Park. A few years ago I worked with members of the Vancouver Rat Project to investigate the cause of lumpy ears in rats from one of the shipping ports in that city. 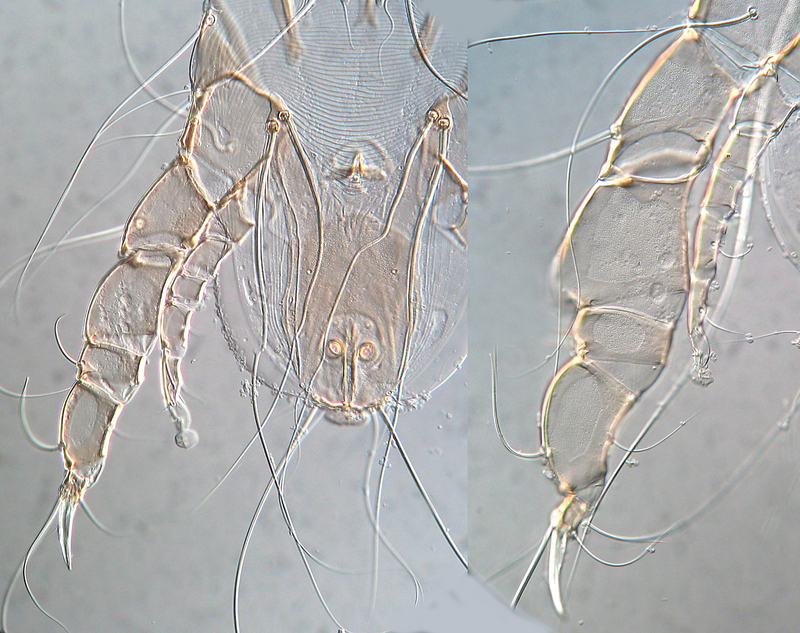 The rodents turned out to have ear mange caused by the sarcoptid mite Notoedris muris (Astigmata: Sarcopidae). As far as we could tell, this was the first record of N. muris in Canada. About two weeks ago, one of the co-authors of this paper, Jamie Rothenburger (now a Doctor of Veterinary Medicine doing her Ph.D. at the University of Guelph in Ontario), emailed to ask if I could look at a chunk of skin taken from a mangy squirrel. Jamie suspected Notoedres centrifera Jansen. This sarcoptid species has been reported to cause mange in many species of sciurids in North America and may be hindering recovery of the western gray squirrel. 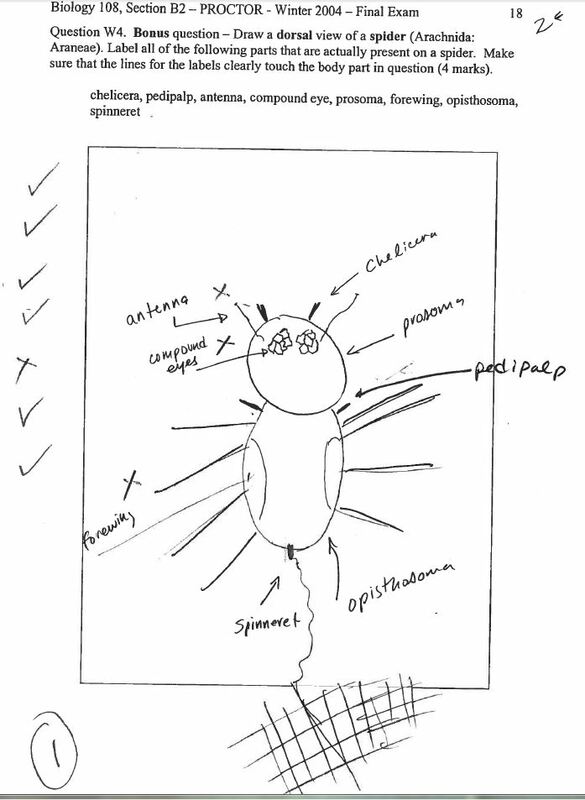 Diagnosis and drawings of Notoedres centrifera from Klompen (1992). Jamie had only histological sections through mangy squirrel skin, though, which are difficult to match to species descriptions. I said sure and soon received a small frozen chunk of integument via courier. The skin sat in a saturated KOH solution for a couple of days to encourage its dissolution. 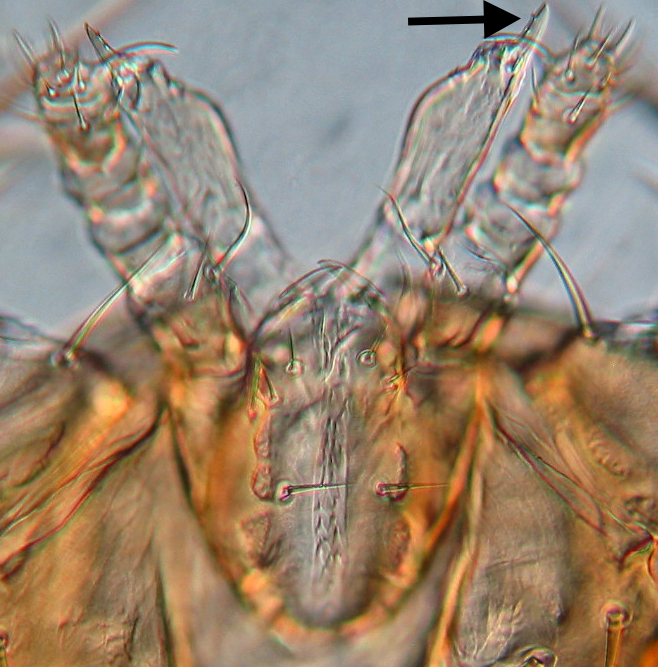 The single mite I managed to find in the smelly skin slurry matched Klompen’s illustrations of N. centrifera (above), and was a similar size (200 um). 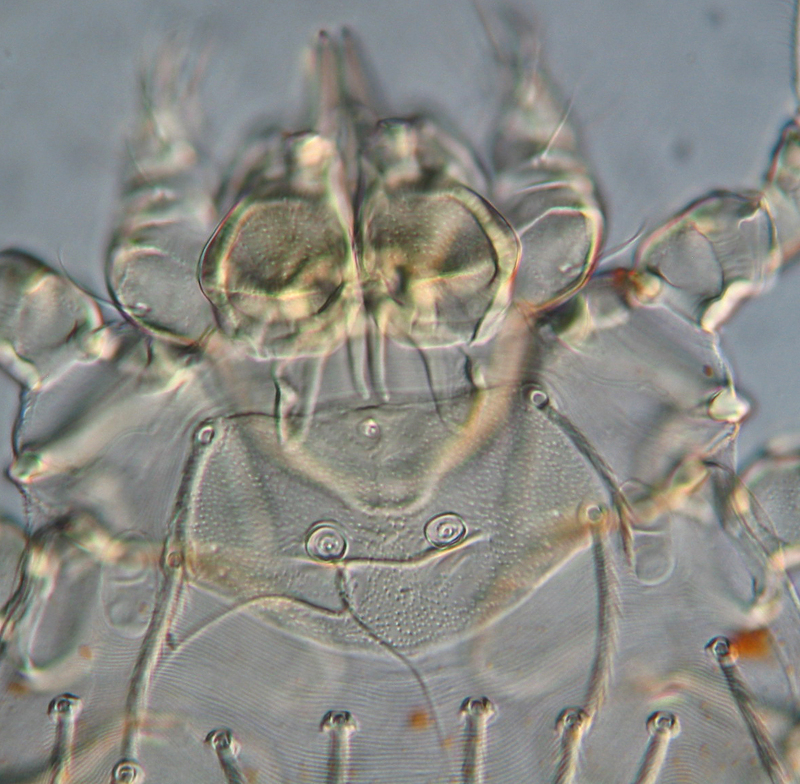 Ventral view of the sarcoptid mite I found in the squirrel slurry. So, diagnosis confirmed, end of story, right? 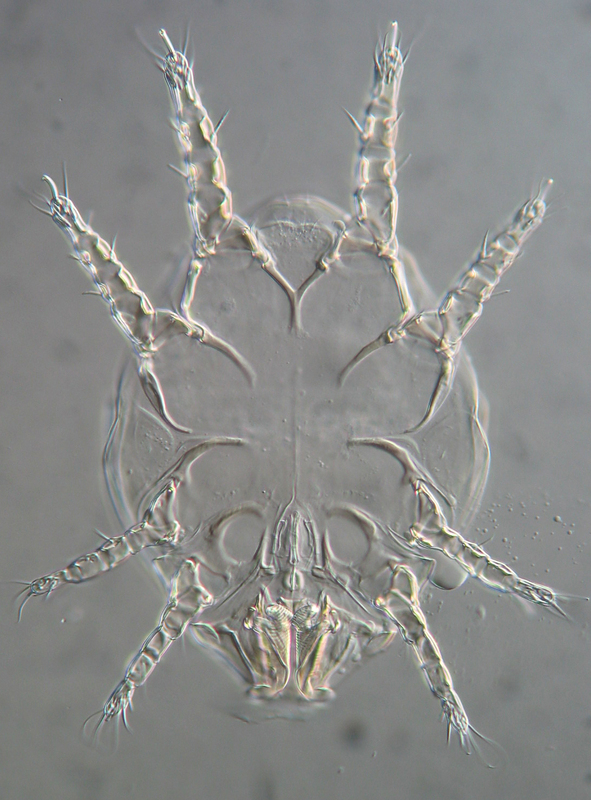 Well, actually, the mite isn’t the reason for the ‘mystery’ in the title of this post. In addition to the one tiny Notoedres, I found several almost as miniscule (600 um), translucent cigar-shaped objects in the digested squirrel skin. Out of curiosity, I mounted three of them yesterday. [UPDATE: I revisited the slurry and found a fourth critter, images of which are at the bottom of the post]. Today I spent several hours futilely trying to pin them down to a taxon finer than ‘probably some sort of arthropod’. 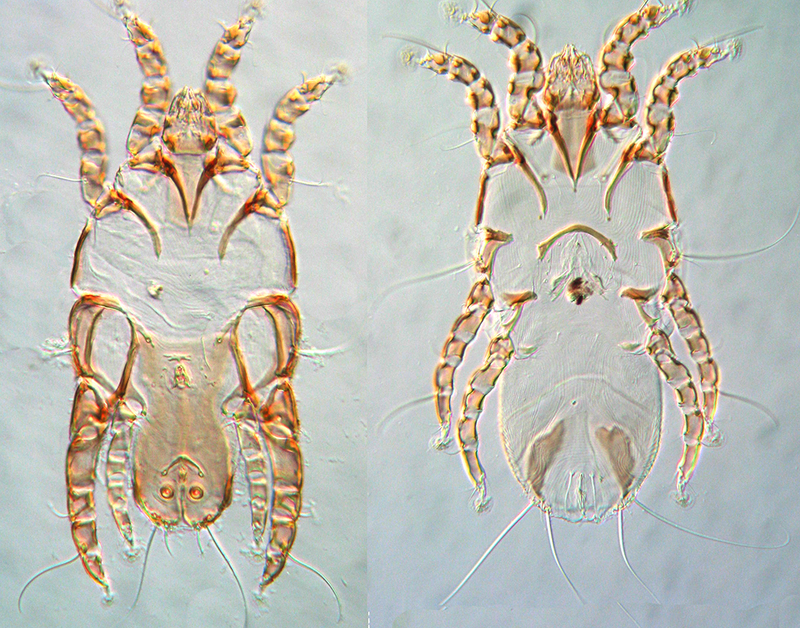 My first thought as I mounted them was follicle mites (Demodicidae) in cysts, but nope, not enough legs. There seem to be only two pairs! 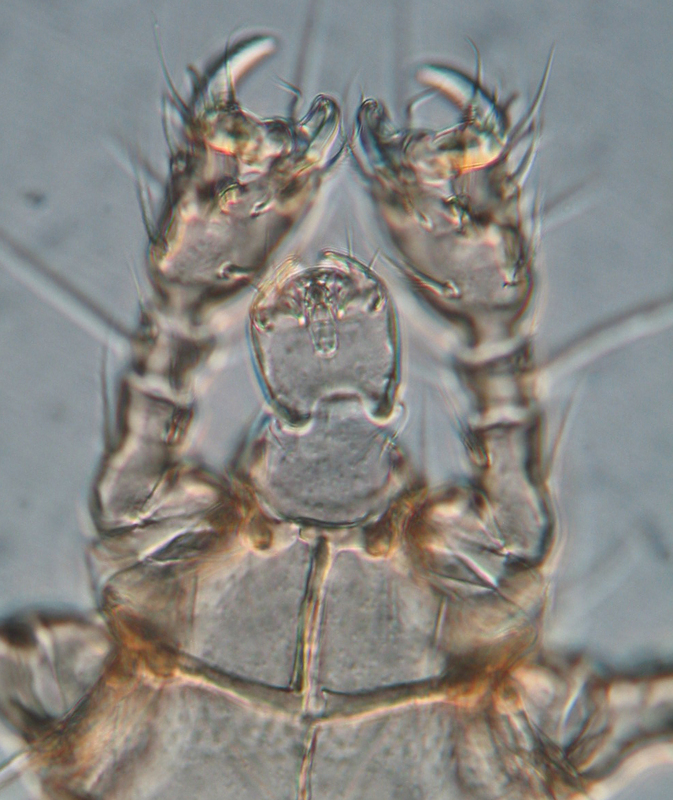 Plus they end in single large claws or clawlike tarsi, whereas follicle mites have two small claws per leg. Embryonic insects in eggshells? Still not enough legs, unless the first pair develop much more slowly than the last ones. Maybe…see third photo below. What insects might be on squirrels? 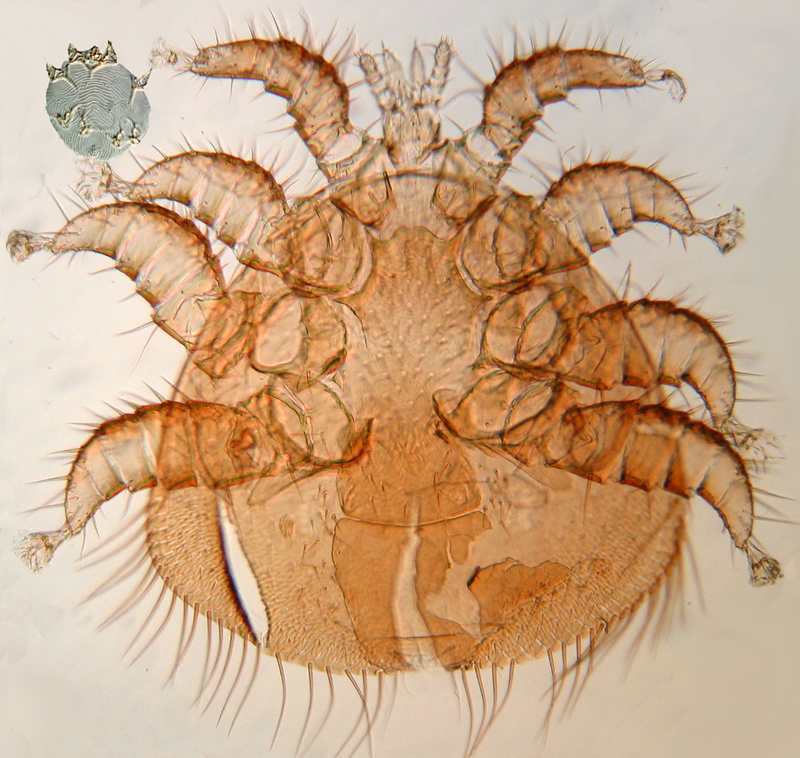 The critters don’t look much like lice, because to my knowledge no lice have a big tuft of bum setae. 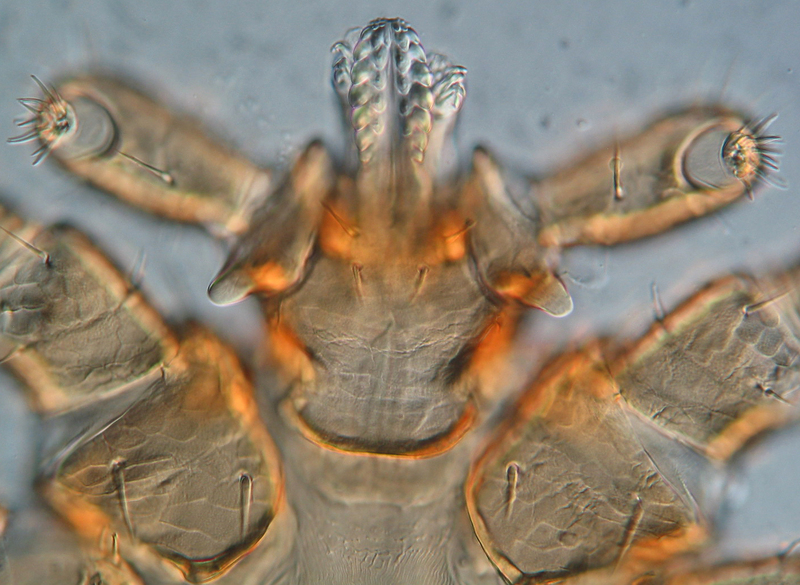 And what are those weird flash-shaped setae at the head end? Are those round things spiracles? And why is there scalloped ornamentation on the bases of the four well-developed legs? None of the many entomology texts I consulted had images at all similar to these. 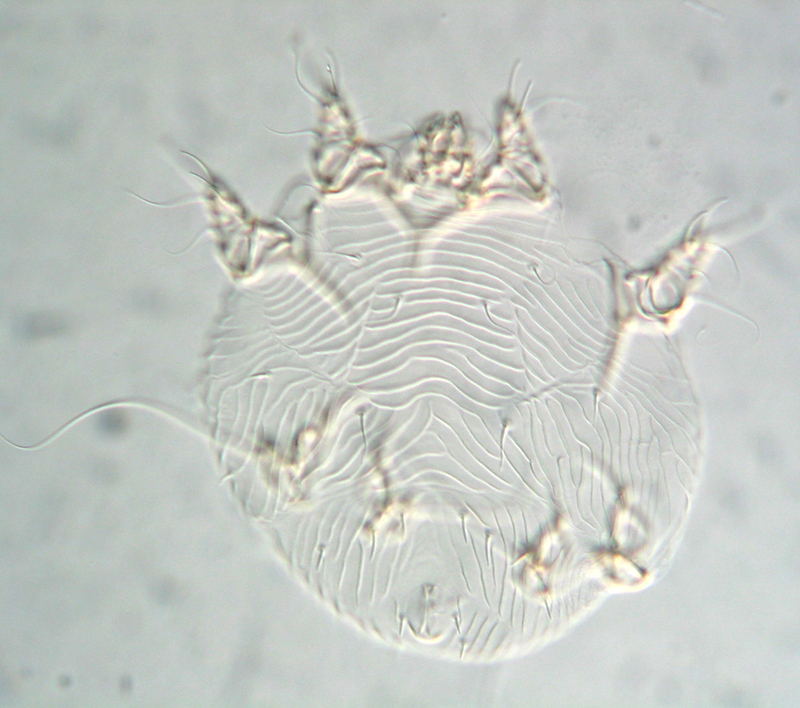 Ventral view of one of the four-legged embryos (?) from the squirrel skin. Note the long whippy bum setae (I assume that’s the bum end). 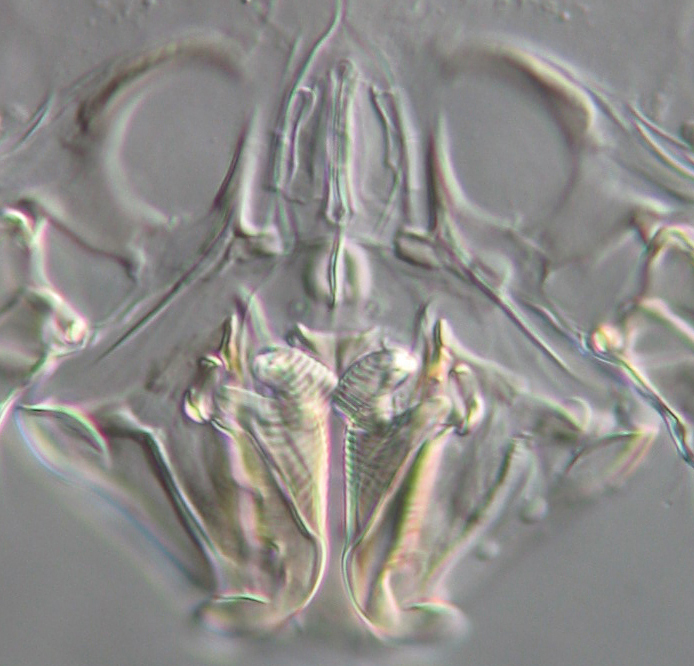 Lateral view of one of the other embryos. It looks like there might be another pair of very poorly sclerotized anterior legs, with the faint leg tips clasping on of the more posterior legs. Flask shaped setae on the head-ish end. 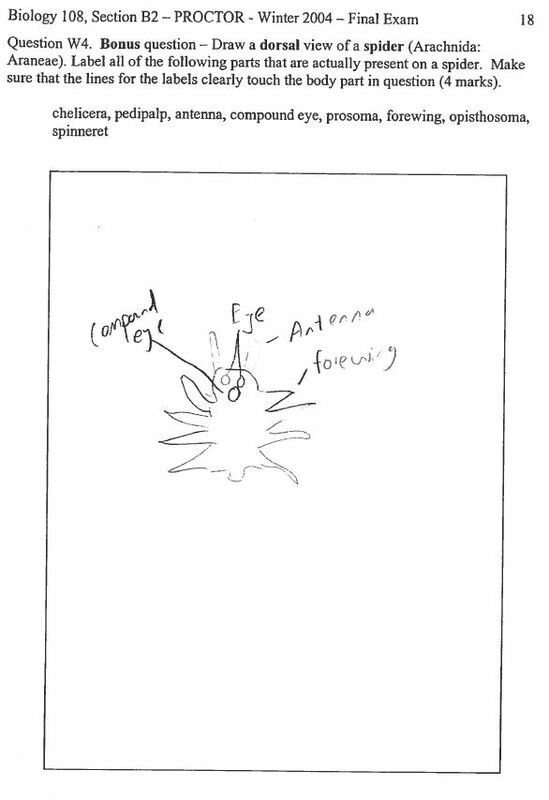 Something that might be an anterior spiracle. A row of abdominal spiracles? 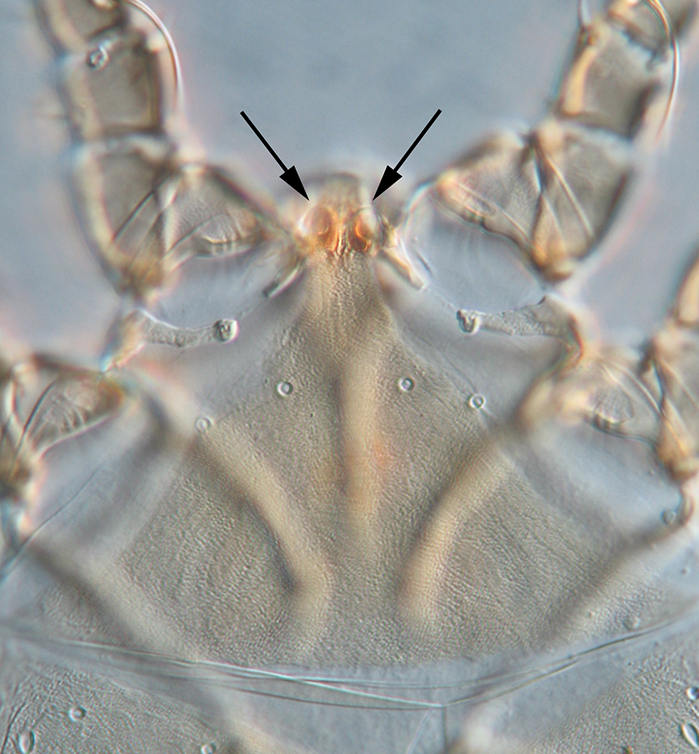 There’s a fan-shaped structure at the base of each of the sclerotized legs (most clear on second leg from the right). They remind me of the ventromental plates of chironomid larvae. I managed to mount one of the mystery critters with legs spread out and saw that the fan is actually split, like an open bivalve shell. Note also the trachea. At the anterior end of the thing are two sets of what look like trichobothrial bases, but there are no trichobothria or other setae coming out of them on any of the four critters that I mounted. I am thoroughly stumped. Help! Klompen J.S.H. 1992. 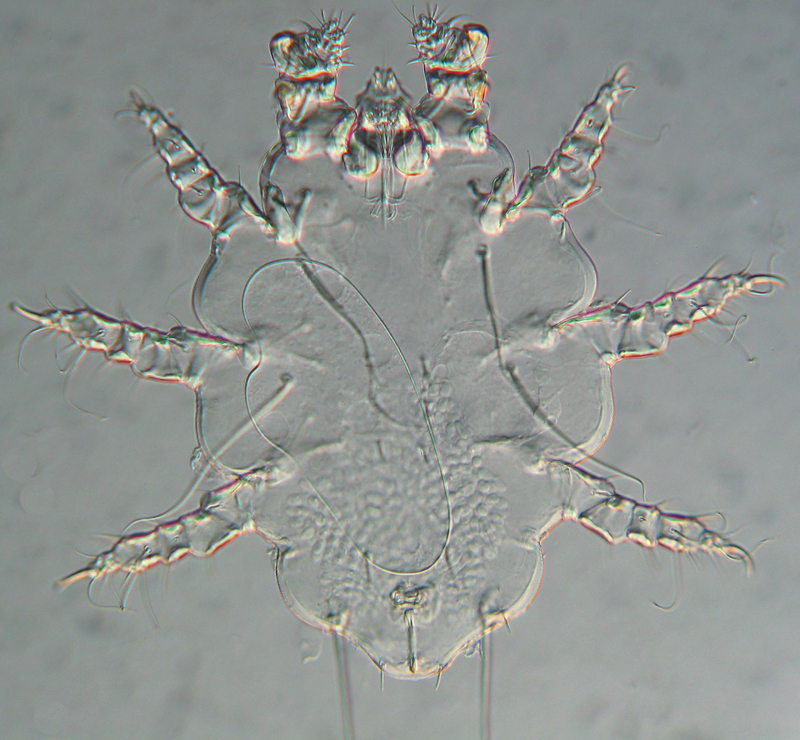 Phylogenetic Relationships in the Mite Family Sarcoptidae (Acari: Astigmata). Museum of Zoology. Ph.D. thesis, The University of Michigan, Ann Arbor, MI, USA. A couple of weeks ago my colleague Fabio Akashi Hernandes* from the Universidade Estadual Paulista sent me the file for a poster that I immediately printed on high-gloss paper and proudly affixed to the door of my office. The poster depicts some of the feather mites that Fabio has found on birds from Brazil and a few other tropical countries. Eye candy for acarologists! They are all scaled to the mm mark at bottom right, where you can see the gigantic Laminalloptes phaetontis (Fabricius) from tropicbirds. 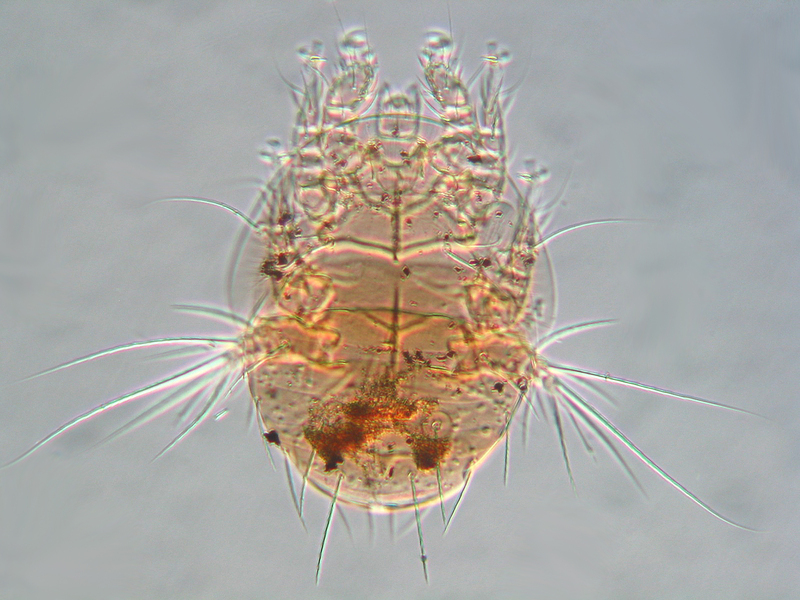 Among the selected mites are the hoatzin-dwelling Opisthocomacarus umbellifer (Trouessart) (mite #40) in which both sexes are adorned with feather-like setae of unknown function. 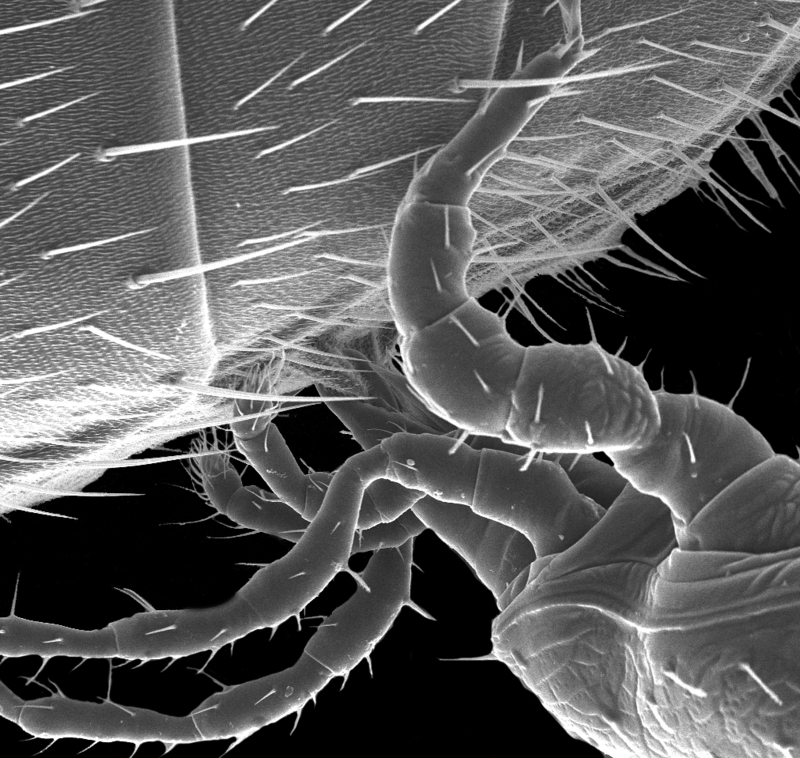 Typically, though, male feather mites are more elaborate than females. The poster includes species whose males have vicious-looking hind legs (e.g., 1, 28), or are asymmetrical (e.g., 31, 32, 58), or are very well-endowed (20). 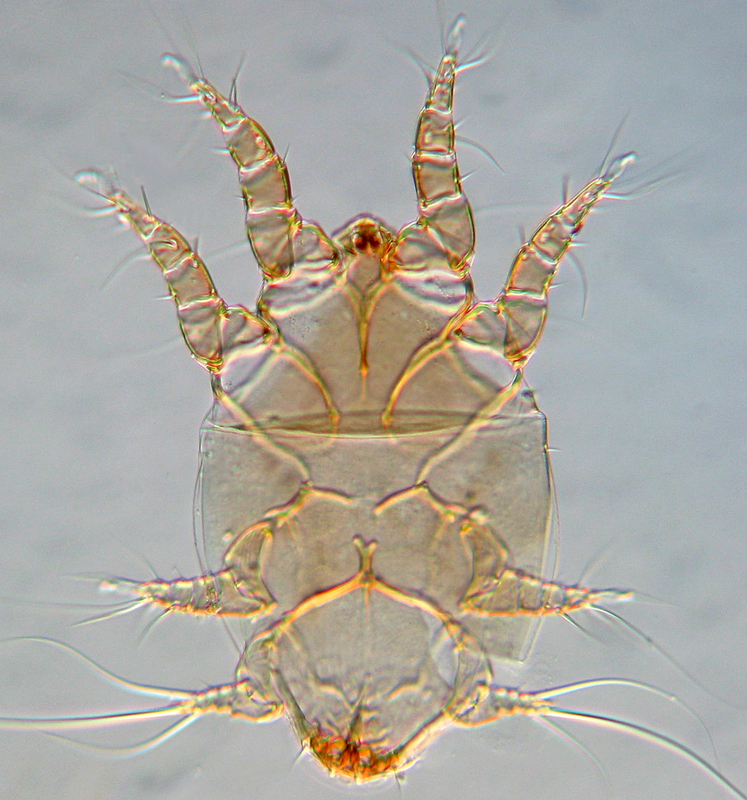 Fabio is doing some marvelous work on taxonomy and ecology of these mites, including the very recent discovery of a host-switch from wild cuckoos to domestic poultry. But even though he and his colleague Michel Valim have been working hard to describe new species, at least 80% of bird species in Brazil have yet to be investigated for their acarofauna. Many more wonders await. Click on the poster image then mouse over and click to magnify. In his very long poem on the nature of poets, Jonathan Swift famously noted that parasites can themselves be parasitzed. A few weeks ago I came across an interesting case of hyperparasitism. I had washed a recently road-killed Yellow-bellied Sapsucker. It yielded many lovely mites and one feather louse. I slide-mounted the latter and representatives of the former. Pteronyssus sphyrapicinus (Astigmata: Pteronyssidae) feather mites from a Yellow-bellied Sapsucker. Male on left, female on right. 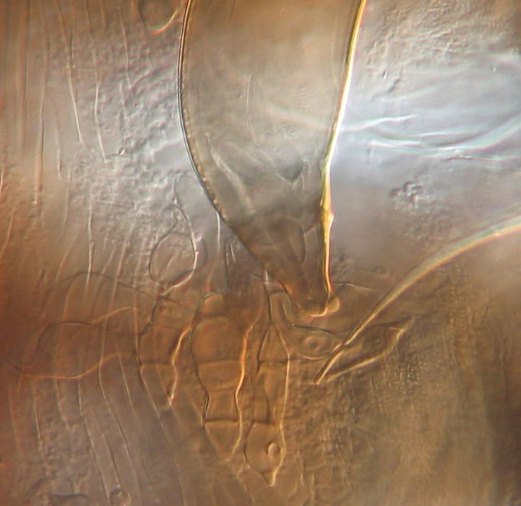 When I looked at the louse under the compound scope I thought its Malpighian tubules had burst out of its abdomen. 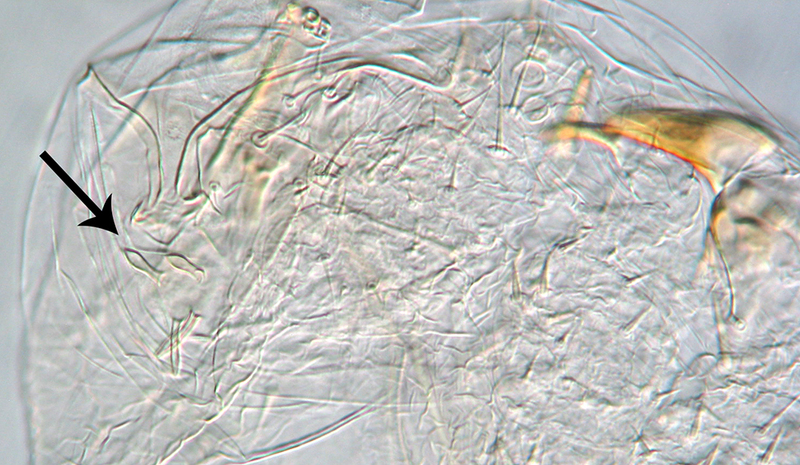 At higher magnification, the tubules turned out to be hyphae. Fungally infected Penenirmus auritus (Phthiraptera: Philopteridae) from a Yellow-bellied Sapsucker. 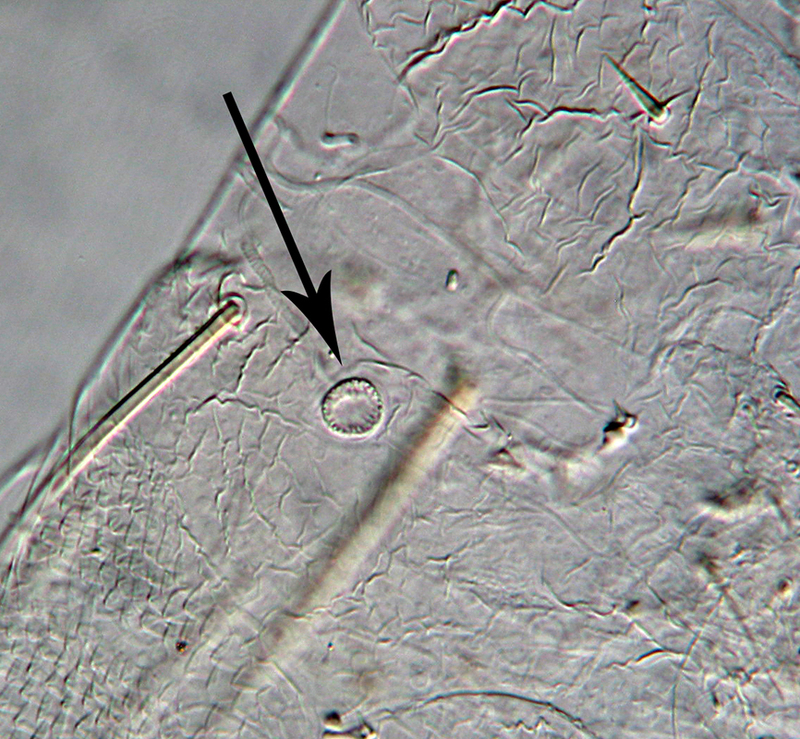 I figured it must be a member of the Laboulbeniales, fascinating and highly modified ascomycotan fungi: look here and here! 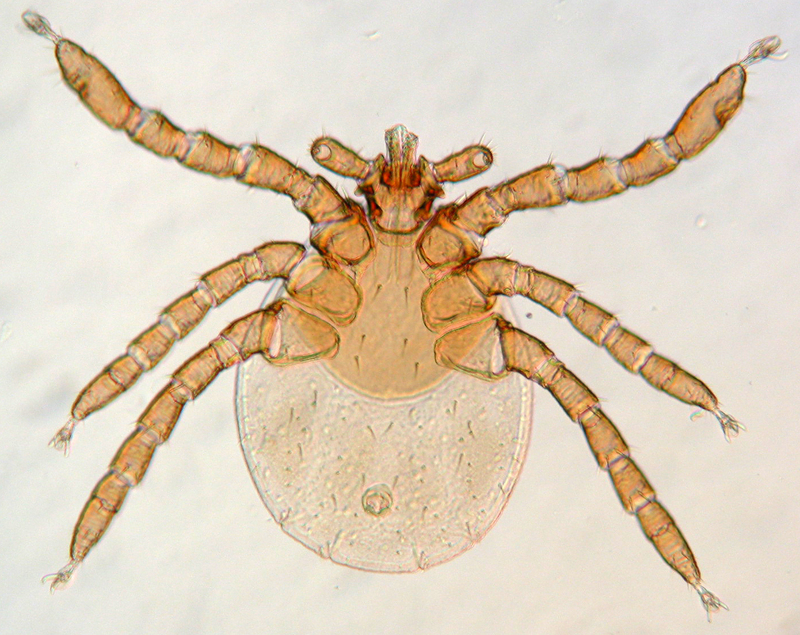 Almost all of the 2000 or so described species are ectoparasites – or perhaps in some cases harmless commensals – of living arthropods. One species has achieved recent notoriety due to its spreading from a native ladybird in the U.K. to an invasive one. I had seen them on various critters before, including beetles and mites, though never on a feather louse. 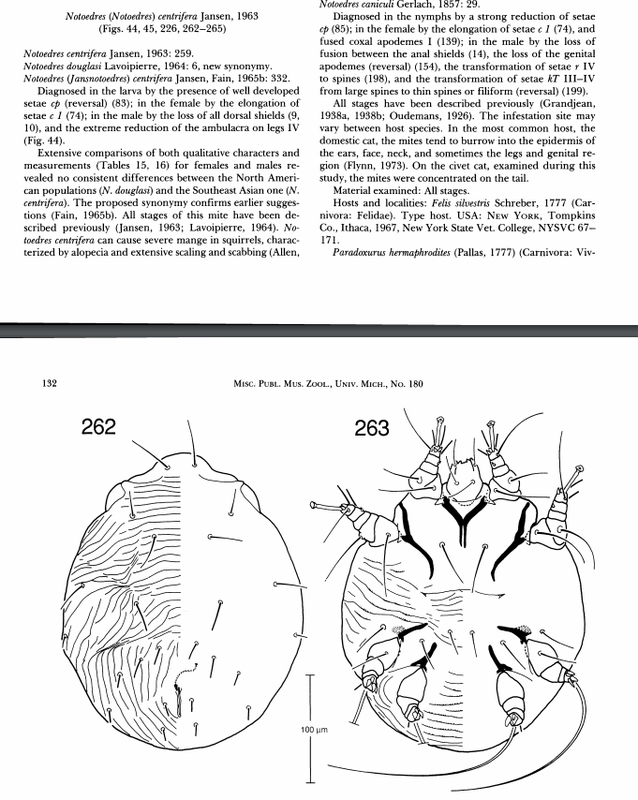 But Googling revealed that in 1951, Wolfdietrich Eichler had published an interesting overview of the Laboulbeniales he’d seen on lice from birds*. They were all from the genus Trenomyces. I asked my mycologist friend Randy Currah if he could tell whether the fungus on my louse was one that Eichler had identified. He referred me to Meredith Blackwell at Louisiana State University. 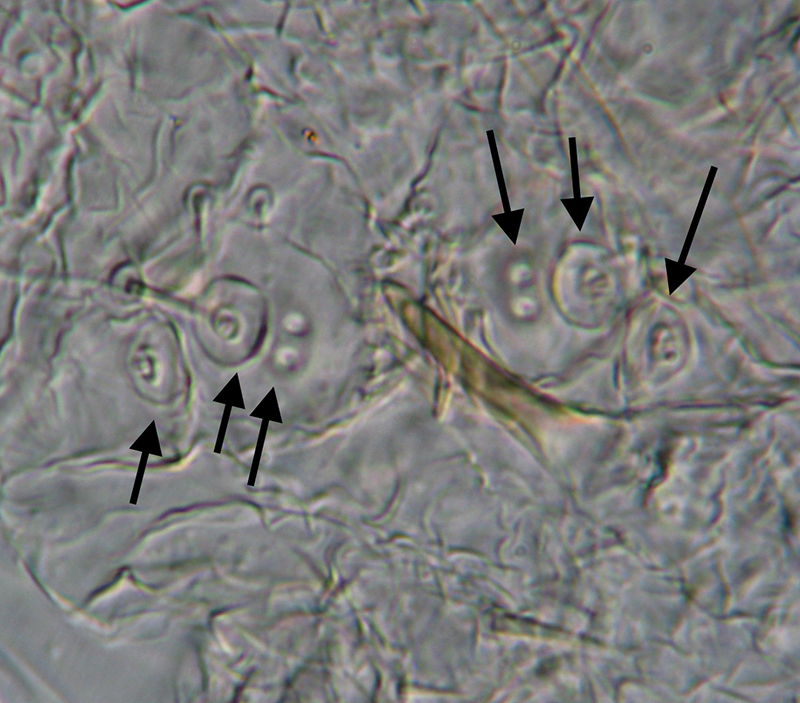 She identified the images as a Trenomyces sp. (like Eickler’s) and then sent the images I emailed to her to Danny Haelewaters at Harvard University. I’m not sure whether Danny will be able to get it to species based on my bad photos, but if he does I will update. UPDATE (22 Aug 2015) – Danny has just identified the fungus as Trenomyces circinans Thaxter, a new record for Canada. Thanks, Danny! Closer view of the Trenomyces showing a big ascocarp, two ascospores (lower right) and juvenile multiseptate things that probably have proper names but I will just call ‘babies’. *Eichler, W. 1951. Laboulbeniales bei Mallophagen und Läusen. Feddes Repertorium. 54(53):185-206. 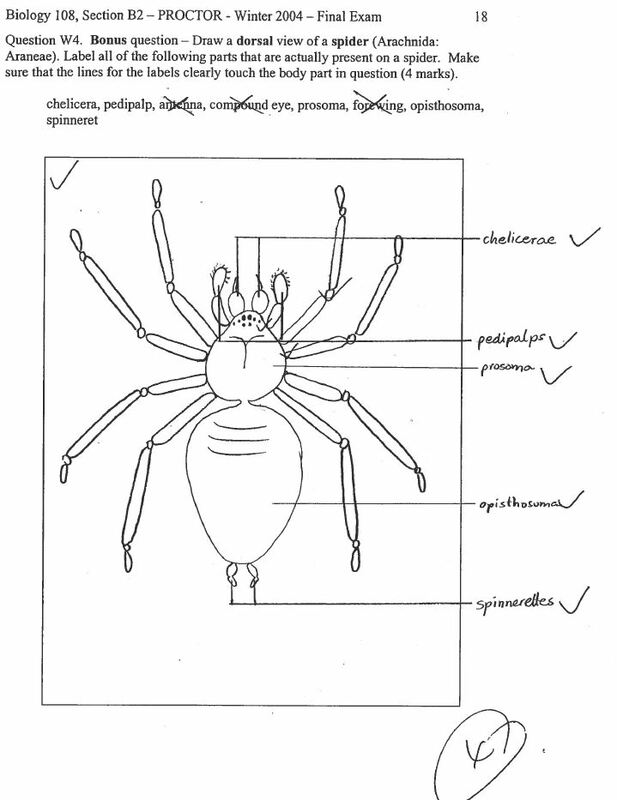 This summer the arthropodologists in my department are being moved from one building to another, as part of the mysterious game of reshuffling that university administrators so enjoy. As preparation for the move, I’m downsizing the contents of my filing cabinets. 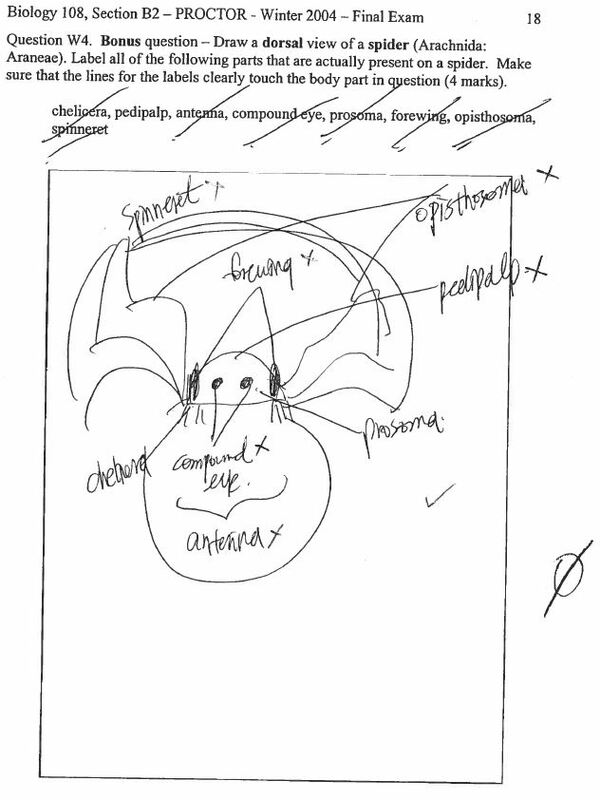 In a folder from 2004 I found this collection of drawings from the first time I taught Biology 108, Introduction to Biological Diversity. I had given two lectures on arthropods with a strong emphasis on differences in appendages and tagmata among the major groups. 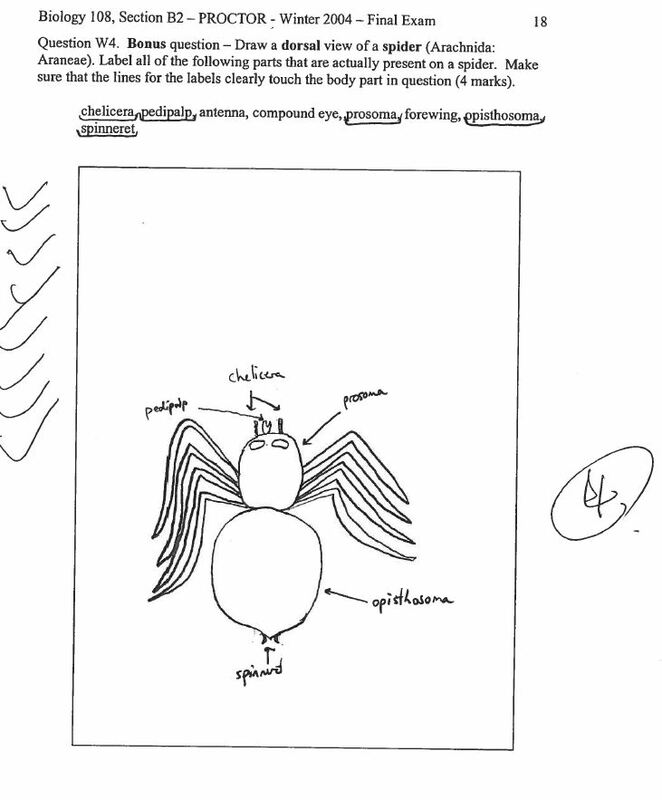 This is what I thought was an easy bonus question on the final exam: draw a spider and label the relevant parts. Here is a selection of drawings, from ‘quite respectable’ to ‘huh?’. 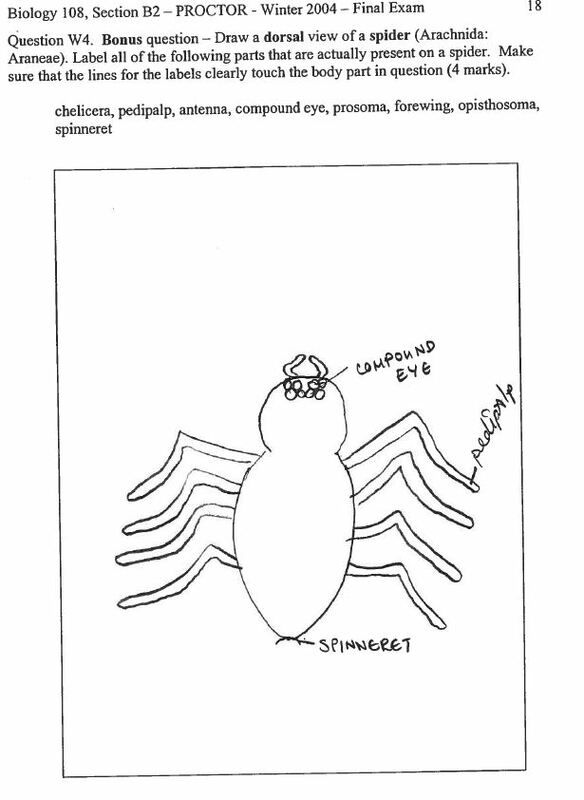 Based on the last image, some university students believe that spiders should be speared on toothpicks and served in martinis. *apologies to Facebook friends who’ve already seen a version of this. 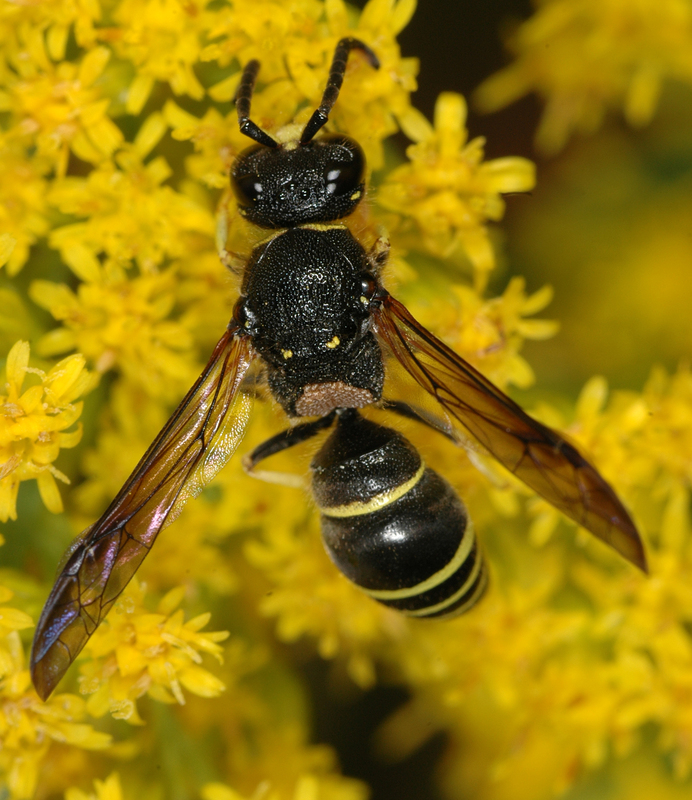 In March, I was given two specimens of solitary wasps that were covered with mites. The first was one of several Crossocerus (Crabronidae) that had overwintered in holes in a wooden chair left outside on the campus of the University of Alberta. 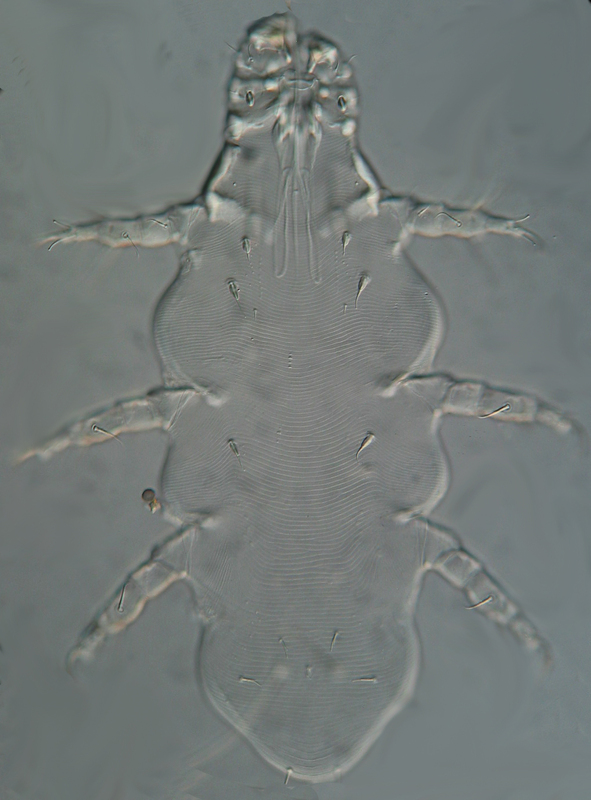 I had expected the mites to be phoretic deutonymphal astigmatans, but they weren’t, they were adult female scutacarids (Prostigmata: Scutacaridae). Many scutacarid species have phoretic and non-phoretic morphs. The big anterior tarsal claws you can see (blurrily) on the photo below are typical for phoretomorphs. 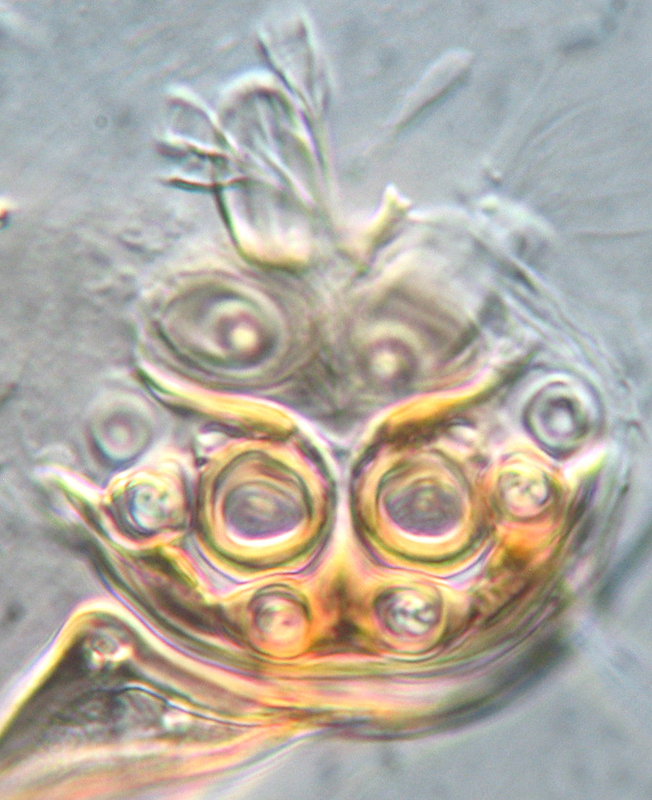 What wasn’t typical was a pair of strange internal structures that became apparent in well-cleared specimens. At first I thought the pair of round things near the female’s genital area were sperm-storage chambers. 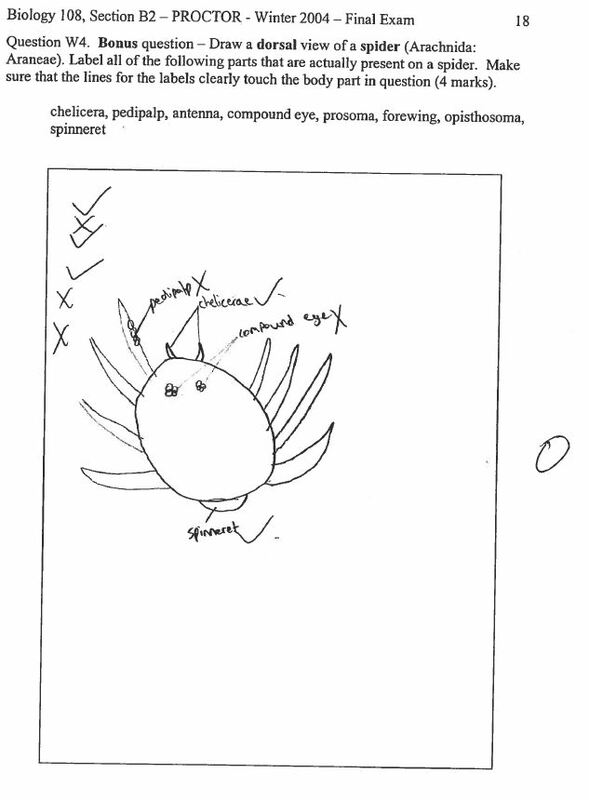 But when I Googled ‘Crossocerus’ and ‘Scutacaridae’, I found a paper that showed I was only half right – they were sporothecae*, not spermathecae! 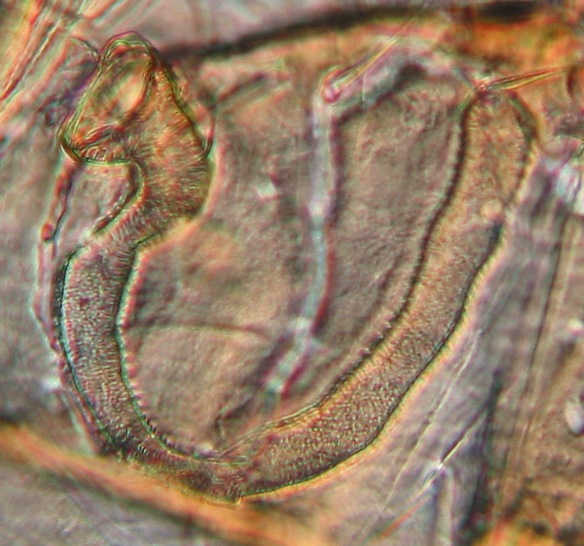 Two big spores tucked into the genital atrium of this female Imparipes. 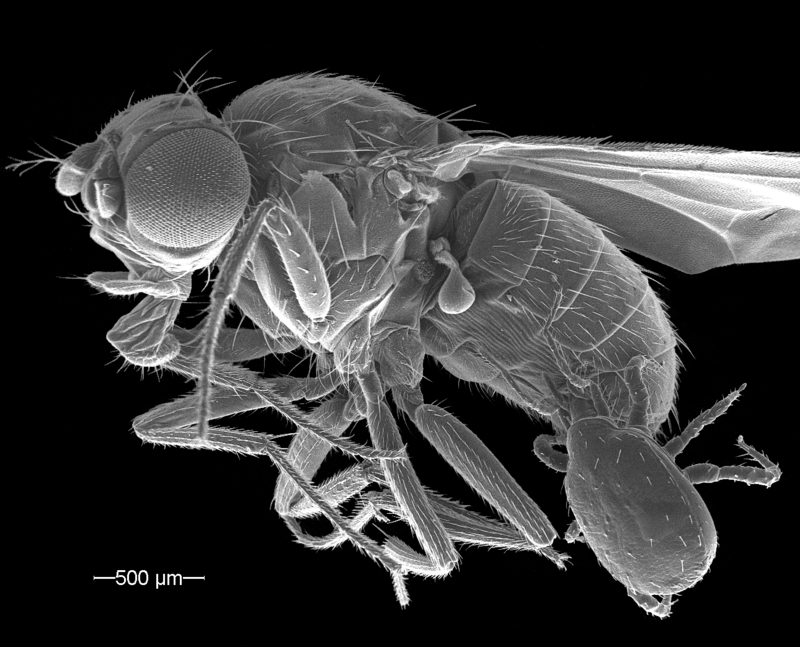 Ebermann & Hall (2004) described a new species of scutacarid, Imparipes haeseleri, from several species of wood-associated Hymenoptera. 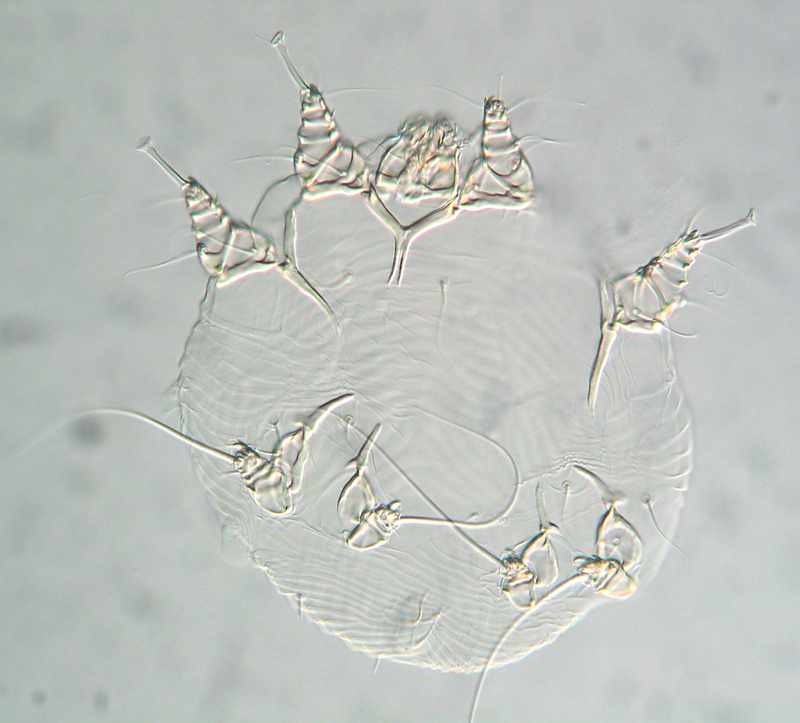 In the genital atrium of these mites, they observed two large round fungal spores, one on each side, looking remarkably similar to the ones in the mites from the rotting chair. 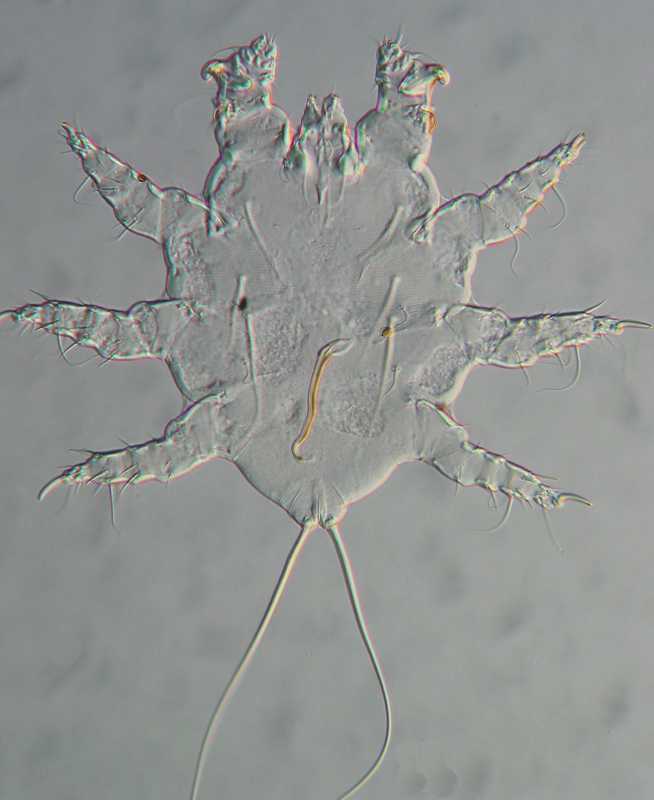 I asked Evert Lindquist, an expert on the Heterostigmata (the larger group to which Scutacaridae belongs) if these mites were Imparipes. Yup, they were. Were they I. haeseleri? 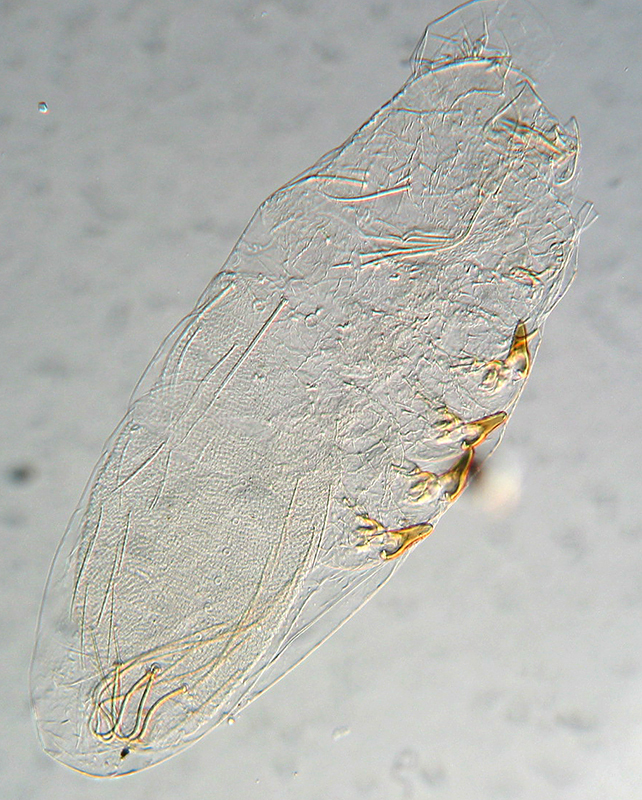 There is a closely related species known from North America, I. vulgaris, but several setal characters matched haeseleri rather than vulgaris so I decided to go with Imparipes cf. haeseleri. The second wasp was collected from an overwintered artificial nesting block that was supposed to house solitary bees. It was an Ancistrocerus sp. (Vespidae: Eumeninae). 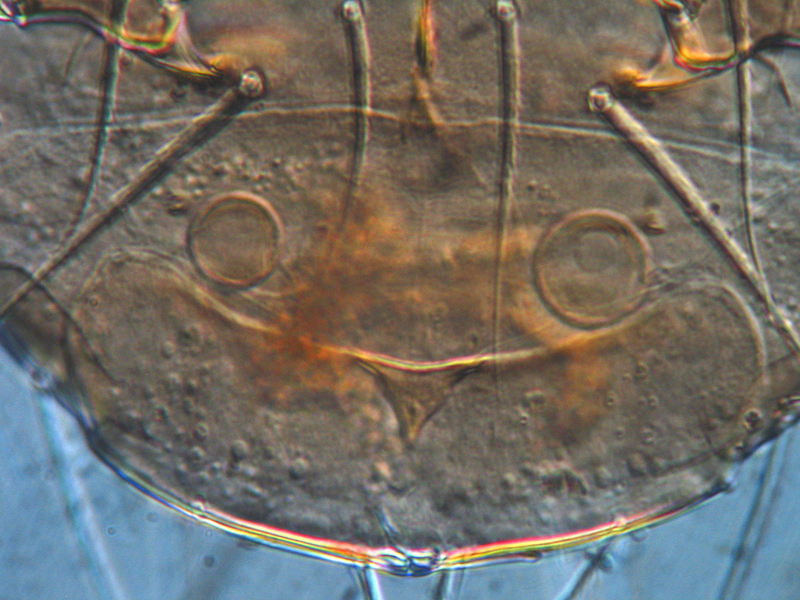 Knowing this, it was easy to guess who the mites were, and slide-mounting confirmed it: deutonymphs of a Kennethiella sp. (Astigmata: Winterschmidtiidae). 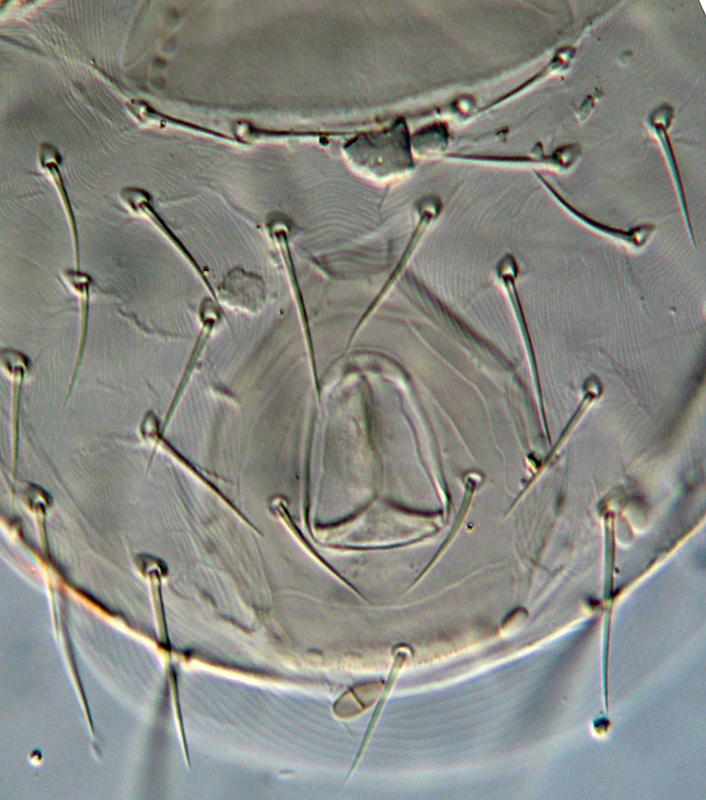 Like almost all phoretic deutonymphs of Astigmata, these Kennethiella have a terminal sucker plate to adhere to hosts. Unusually, they also have anterior ocelli. Why ocelli are present in only a small number of Astigmata is unclear (at least, it’s unclear to me). It’s worth reading the original to appreciate the full intricacies of these intertwined life-cycles. A home-grown Ancistrocerus with a load of Kennethiella, from my back yard in Edmonton a few years ago. 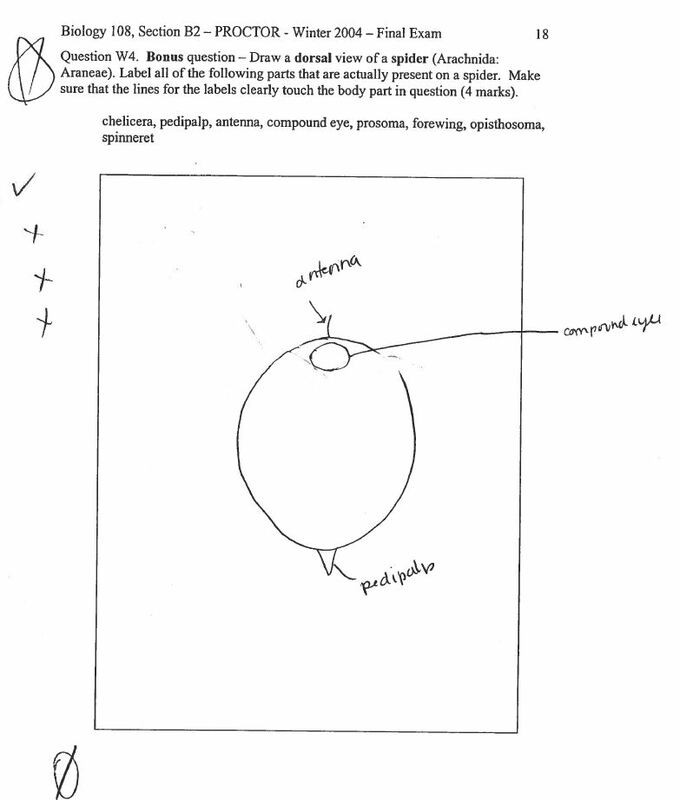 *according to Evert Lindquist, they aren’t sporothecae (which are spore-storage sacs) but simply the spores themselves, tucked into corners of the genital atrium. Thanks, Evert! My freezers at work are getting rather full, so I’ve been washing birds and sending the clean bodies to the Royal Alberta Museum. Last week I washed a batch of white-throated sparrows (Zonotrichia albicollis) that had met a sad communal death by flying into a window in Edmonton. They were very mite-rich, providing dozens of specimens of Proctophyllodes (Proctophyllodidae), Mesalgoides (Psoroptoididae), and Analges (Analgidae). 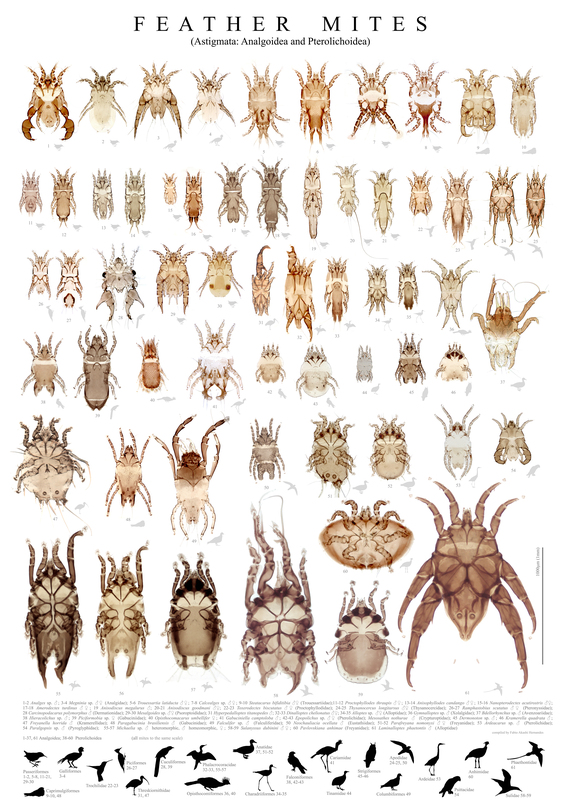 All of these taxa belong to the feather mite superfamily Analgoidea. Analges means “without pain”, and the genus was called thusly by Nitzsch in 1818 because it seemed that even heavily laden birds showed no signs of distress. 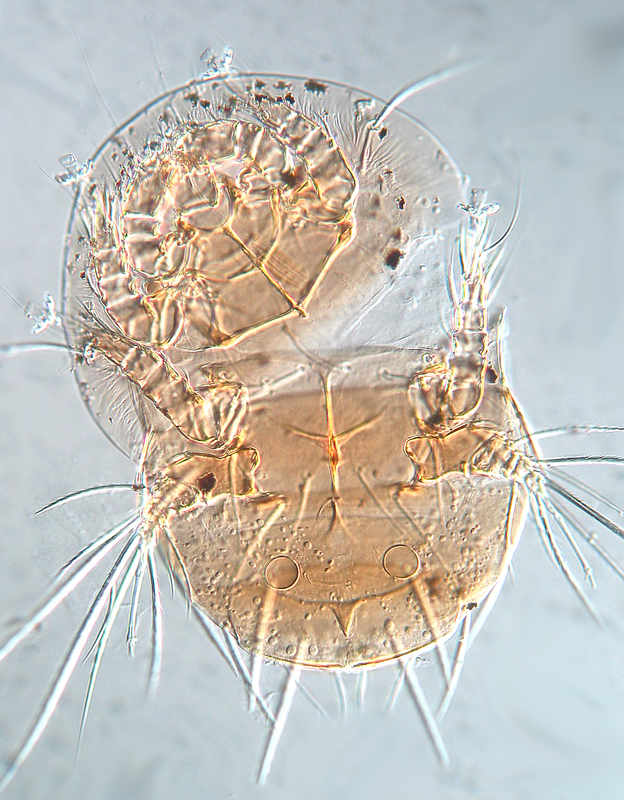 Almost two hundred years later, a huge comparative study by Ismael Galván and colleagues in 2012 compared feather mite load and host condition of 83 species of birds and found no evidence of a negative relationship. 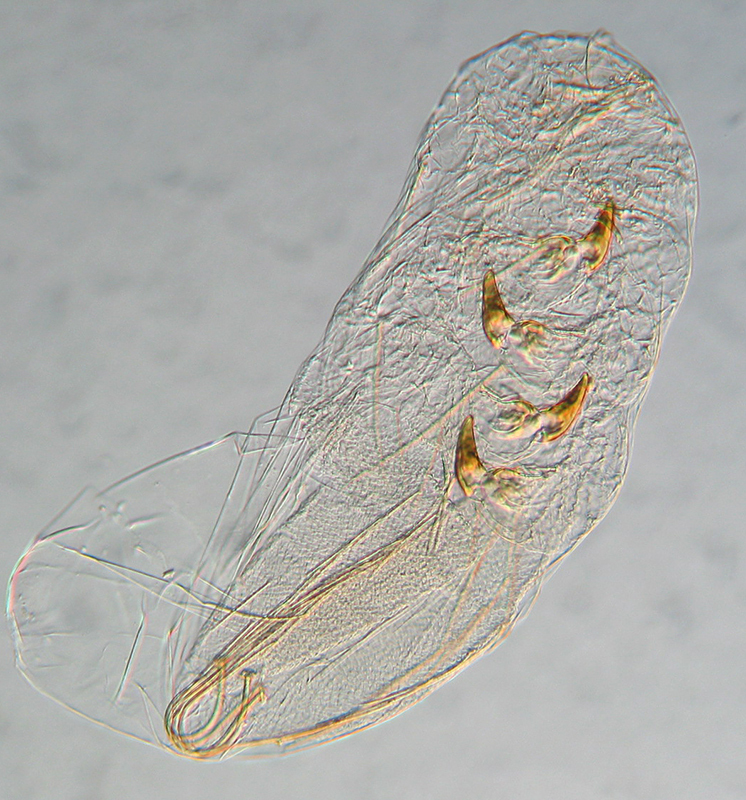 Feather mites in general appear to be harmless commensals of their hosts. Analges species are interesting because of their striking male polymorphism. 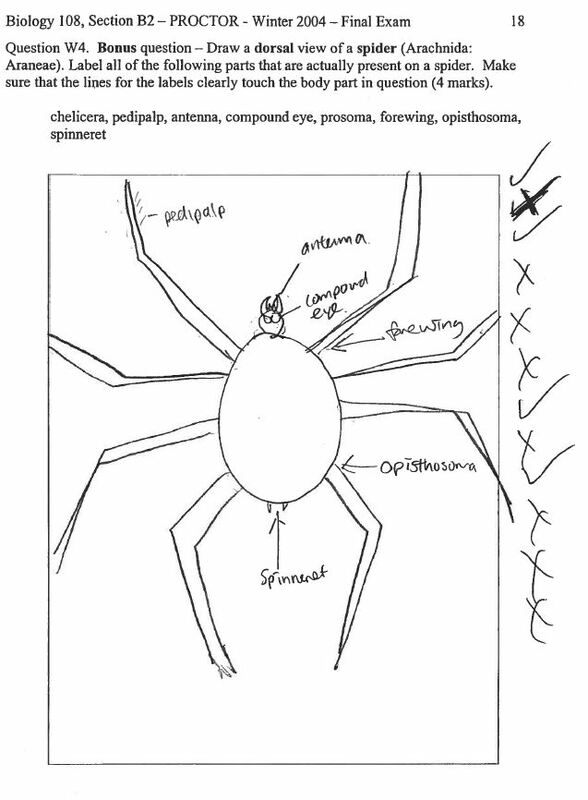 All males differ from females in having enlarged third legs with spear-like tarsal claws, but legs of some individuals are much more grotesquely hypertrophied than others. Such males are also larger overall. Analges sp. 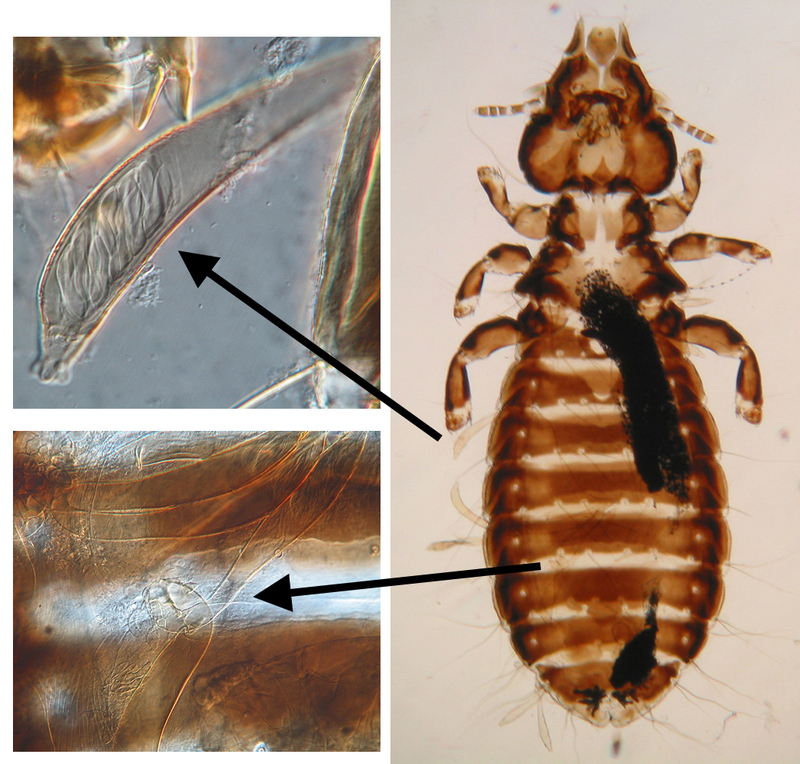 mites from white-throated sparrows from Edmonton, Alberta. From left to right: female, homeomorphic male, heteromorphic male (all to the same scale). 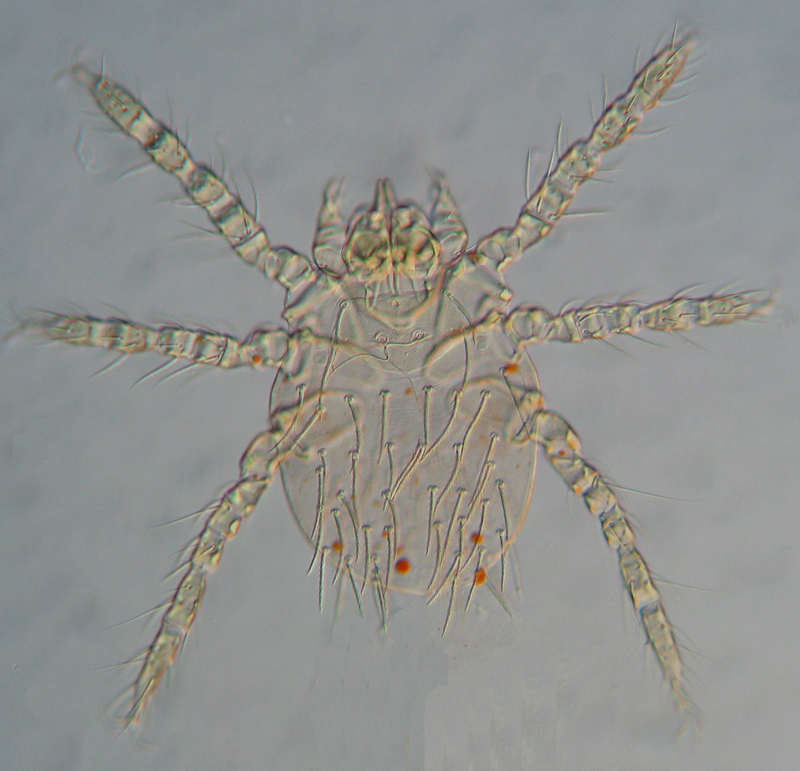 Male polymorphism is very common in feather mites and many other Astigmata. The less elaborated male forms are typically called ‘homeomorphs’ and the extravagant ones ‘heteromorphs’ (the reason for the terms being that the former are more similar to females than the latter). But what are the modified third legs used for? Holding females? Stabbing rival males? I’m not sure that anyone knows. 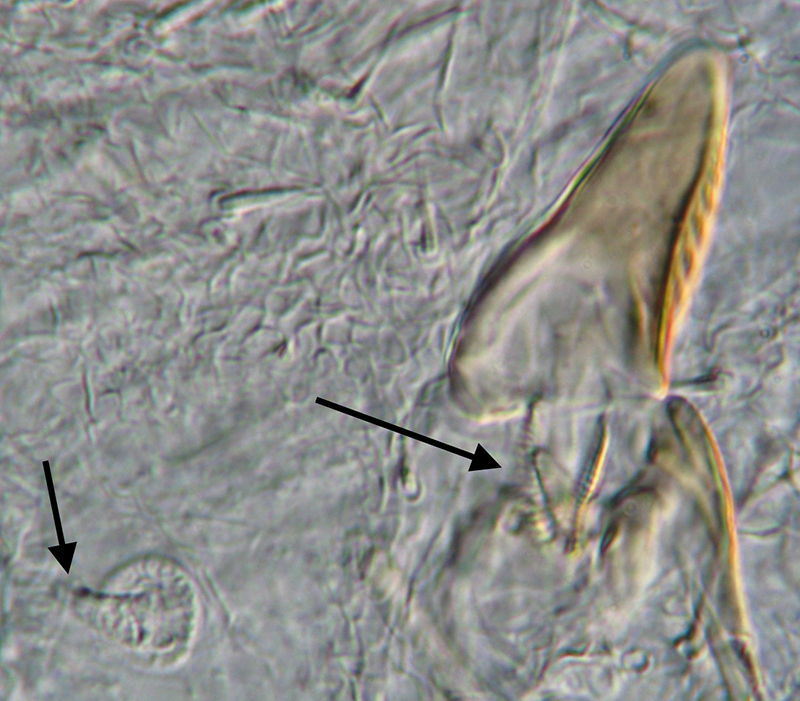 Legs of homeomorphic (left) and heteromorphic (right) male Analges. The pointy tarsal claws look nasty.